Ahmet 5PC SETS TABLE+ 4 CHAIRS - EspressoCream colored Bi-cast vinyl chairs..
Alita Dining Set 6pc set (TABLE + 4 SIDE CHAIRS + 1 BENCH)A r..
A reflection of your taste for clean design with both traditional and mo..
Ameillia Dining Collection 5pc set (TABLE+ 4 SIDE CHAIRSThe solid, ..
Ameillia Oval Dining Set 5pc set (TABLE+4 SIDE CHAIRSThe solid, cle.. The solid, clean lines of the Arts and Crafts movement are interpreted f..
Archstone 48in Dining Set 5pc set (TABLE+4 SIDE CHAIRS)Contemporary..
Archstone 60in Dining Set 5pc set (TABLE+4 SIDE CHAIRSContemporary ..
Archstone Counter Height Dining Set 5pc set (TABLE+4 COUNTER HEIGHT CHAI.. Designed for your sophisticated dining space, the Homelegance Aubriella Col..
Aubriella 7PC SETS TABLE+ 6 SIDE CHAIRS - CherryDesigned for your sop.. Leaning towards the styles of industrial, contemporary and transitional, th.. Item Description With relaxed elegance, this five piece dining..
2459 Brooksville 6-Piece Dining Set - Warm Cherry Table: 35.5 x 60 x 30H..
Cicero Dining Set 5 pc (1 Table and 4 side chair)In today’s modern ..
Clayton Dining Set - Dark Oak 6pc set (TABLE + 4 SIDE CHAIRS + 1 BENCH .. Item Description Create a fun and unique dining area with the .. Counter Height Table F2338 and 4 High ChairThis cream-stone slate color tab.. Counter Height Table F2345 and 4 High ChairBeauty, function and form is pro.. Counter Height Table F2347 and 4 High ChairThis counter height table featur.. Counter Height Table F2354 and 4 High ChairEntertain family and friends wit..
Black wood legs serve as an elegant contrast to the neutral toned marble..
Crown Point Counter Height Dining Set 5pc set (TABLE+4 COUNTER HEIGHT CH..
Adorn your dining area with Crown Point Collection. This grand scale cas..
Deryn Park Double Pedestal Dining Set - Cherry 7pc set (TABLE + 2 ARM CHAIR.. Walking into the dining room that is occupied by the Homelegance Deryn P..
Deryn Park Round Pedestal Dining Set - Cherry 7pc set (TABLE + 2 ARM CHA..
Devlin Dining Set - Espresso 5pc set (TABLE + 4 SIDE CHAIRS)The Dev.. Dining Table F2028 and 4 Side ChairThis dining room collection is brushed w.. Dining Table F2061 and 4 Side ChairDine in true French fashion with this me.. Dining Table F2179 and 4 Side ChairThis dining collection features a 7-piec.. Dining Table F2207 and 6 Side ChairTransform your dining room with a collec.. Dining Table F2210 and 4 Side ChairAbove and beyond the call of design this.. Dining Table F2211 and 4 Side ChairBold black, sleek glass and a shiny silv.. Dining Table F2212 and 4 Side ChairThis dining room set with seating for up.. Dining Table F2225 and 4 Side ChairTrimmed in black this rectangular shaped.. Dining Table F2271 with Bench and 4 Side ChairA strong design of bold lines.. Dining Table F2290 adnd 6 Side ChairImperial design is provided with this 7.. Dining Table F2292 and 4 Side ChairAn unforgettable design of bold color an.. 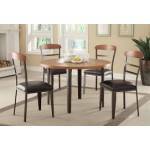 Dining Table F2385 and 4 Side ChairDelight your dining space with this 5-pi.. Dining Table F2391 with Bench and 4 Side ChairLive the cottage life with th..
Dover Dining Set 5pc set (TABLE + 4 SIDE CHAIRS)Chocolate Bi-cast v..
Fillmore Dining Set 5 pc (1 Table and 4 side chair)Ultra-modern in ..